A: Oh, it’s a dictionary. Awesome. What’s it about? 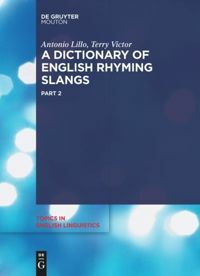 B: It’s a dictionary of English rhyming slangs. A: Right. Cockney Rhyming Slang. A: Apples ‘n’ pears ‘n’ that. Yer actual Cockney. A: Up the apples ‘n’ pears. Up the apples. Trouble and strife, that’s another one. B: Yes, trouble and strife too. Look, the title is Rhyming Slangs. There’s more to it than Cockney English. Look: Slangs. Plural. A: Right. Cockney rhyming slang. Wouldn’t have thought there was enough of it to make a book as big as the big book you’ve got there. B: It’s the result of years of research. A: So, who’s going to read something like that? B: Primarily, it is intended for the academic reader. In the spirit of full disclosure, liberties have been taken with the reportage of the preceding conversation. It is written in British English, or English English to be a little more precise. There are many forms of English. Is this generic English or one of many Englishes? Internationally, you can find American English, Australian English and so forth. It’s that which binds us together and displays our differences. Most international forms of English support rhyming slang or slangs and some fresher rhyming slang originates in the digital world. In the UK there are a number of recognisable regional and national forms of the English language. The same is true of rhyming slangs. Technically, rhyming slang is a word-formation process in which any given word, slang or otherwise, is replaced by another word or phrase – most often a double-stressed expression – rhyming with it. The rhyming part of the slang term is often and characteristically clipped: apples and pears, meaning ‘stairs’, is shortened to apples, and to the uninitiated the phrase up the apples is rendered as nonsense. This is the classic ‘Cockney’ rhyming slang form. Then, in the same ways that English populated the world and evolved into myriad resident variants, rhyming slang travelled to distant parts and adapted to requirements. For instance, Noah’s Ark, an American and Australian ‘shark’ reflects a cultural environment that has little in common with a Cockney’s ‘lark’, senses that are half a world and half a century apart. Many rhyming slangs rely on a local accent for support. Whilst corned beef relies on perfect Cockney pronunciation for ‘the teeth’in Scotland and North East England it is equally well used as rhyming slang for ‘deaf’ (or ‘deef’): as different as DC and Marvel: same idea but different universes of origin. Geographically and historically the origins and spread of an idea depend far more on the idea than the source. Rhyming slangs are recorded around the world and into cyberspace… And then there are all the variant technical forms. DoERS is a big brick of a book. Bigger by far than any big brick of rhyming slangs before. Topped off with a substantial introduction and tailed with a fifty-page list of sources, the dictionary proper has, depending on your expectations, about three times as many headwords as any previously published work in the field. Every page has linguistic treasure. One of us is an independent scholar, the other an academic linguist. Together we are lexicographers. So, to answer the rhetorical question, we really wouldn’t be much good at curing the common cold. The research and compilation was done in our own time and the project itself took us five years. While the hillman is sitting at home sniffling with an uncured potatoes in the mould, the Putney Bridge could do a lot worse than get lost in our Dictionary of English Chitty Chitty Bang Bangs.